Well lovely people, it's over for another year. Any one else glad not to have to take photos everyday? Monty sure is! When I participated in Me Made May for the first time last year, it really gave me a sense of what I was missing in my handmade wardrobe and really made me analyse why I wasn't wearing a number of my then current hand-mades. 1. I seem to have an unconscious draw to the colour combination of red and blue. 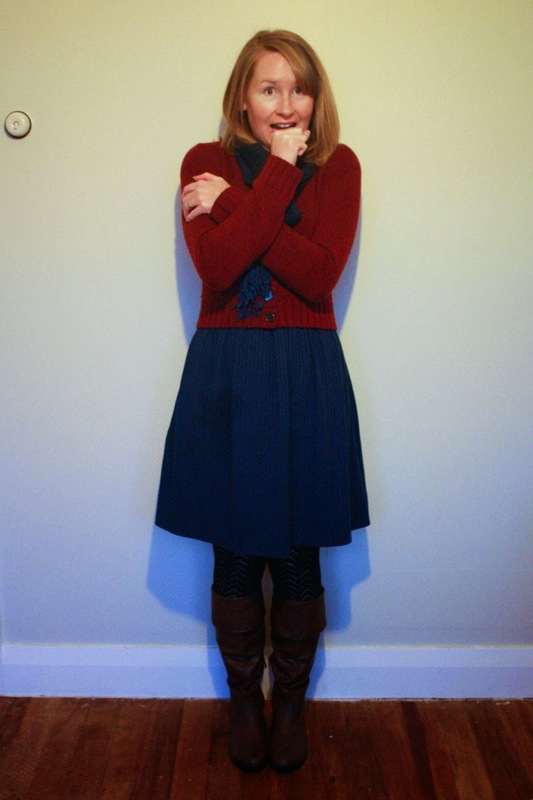 I love blue and I already know I wear a lot of it, but I really didn't realise that I wore so much red! I've always had this thought in the back of my head that red-heads couldn't wear red, but I seem to be bucking my own subconscious ideas on that one! 2. I'm a serial outfit repeater. If I find a combination that works - it's my style, it's comfortable, makes me feel good - then I tend to stick to it and probably wear it at least once a week. But that doesn't make for very interesting daily outfit photos now does it? I found Me Made May this year to be slightly more challenging than last year for the second reason. As I've gotten older (I turned 29 on the 28th May) and a little wiser (I hope! 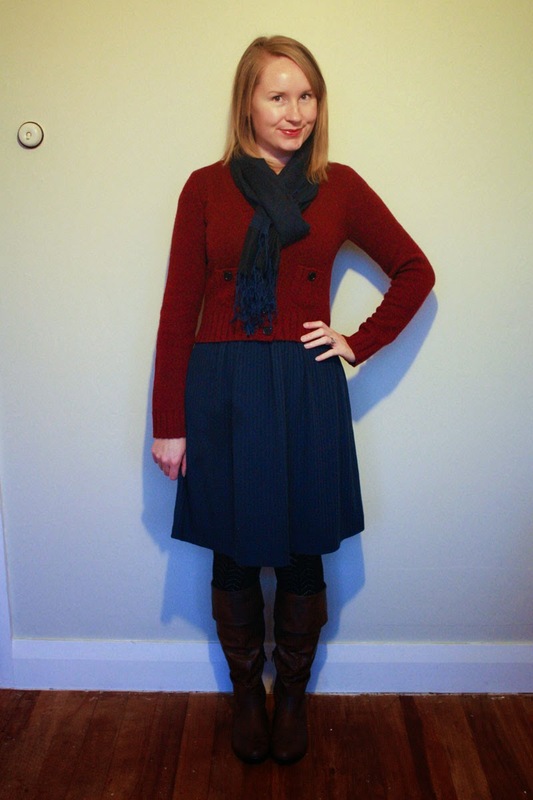 ), I've realised that I can't really be bothered wearing things that aren't comfortable any more. This leans back toward my post earlier in the year on why we don't wear our hand-mades, and it's probably even more true for me now than it was then. I've also realised that I don't have enough of those garments that make up my favourite outfits to keep them fresh and interesting. 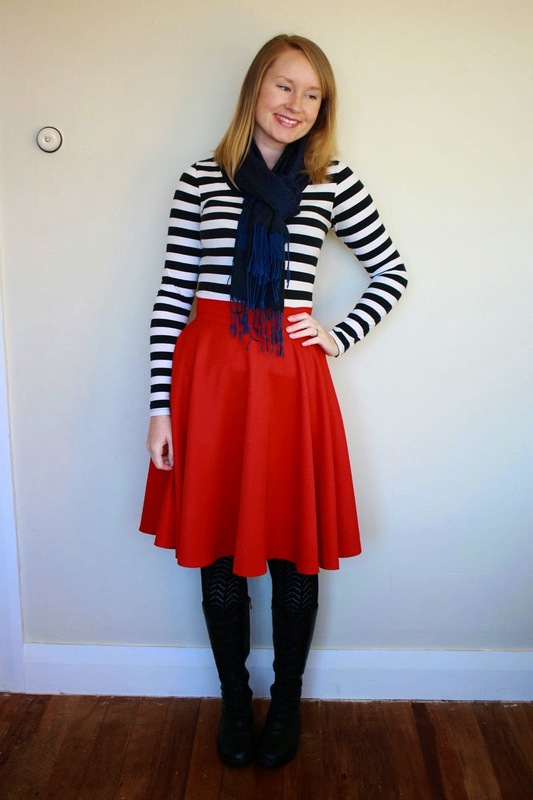 There are only so many ways to wear a red or blue circle skirt. However, this is where I'm pretty darn sure my second pattern (to be released this Friday!) is going to help. It took all of my will not to throw my samples on in the morning during May. 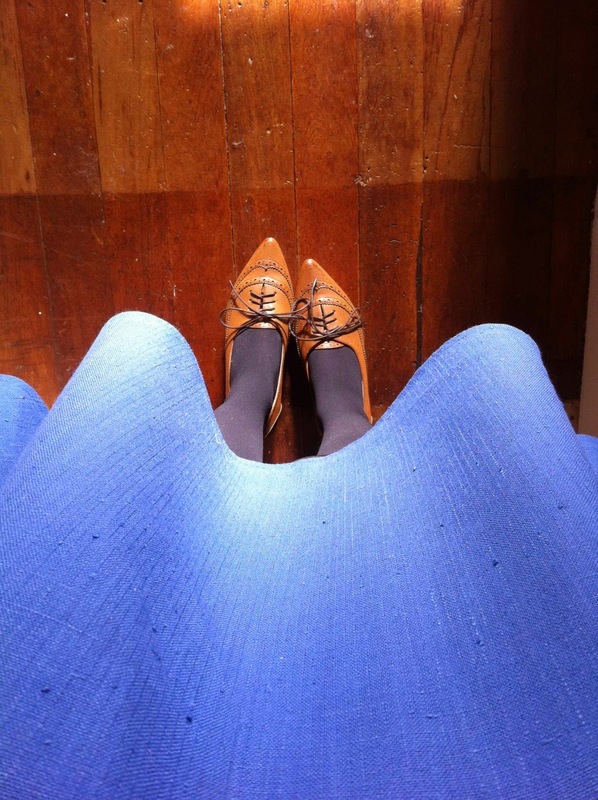 However, due to the fact that I was sans photographer on the very last day of May, meant I could finally wear one and not give it away (you get a photo of my ever favourite blue circle skirt and my feet instead!). 26th May - Snow Day! What I actually looked like. 28th May - Birthday Day! 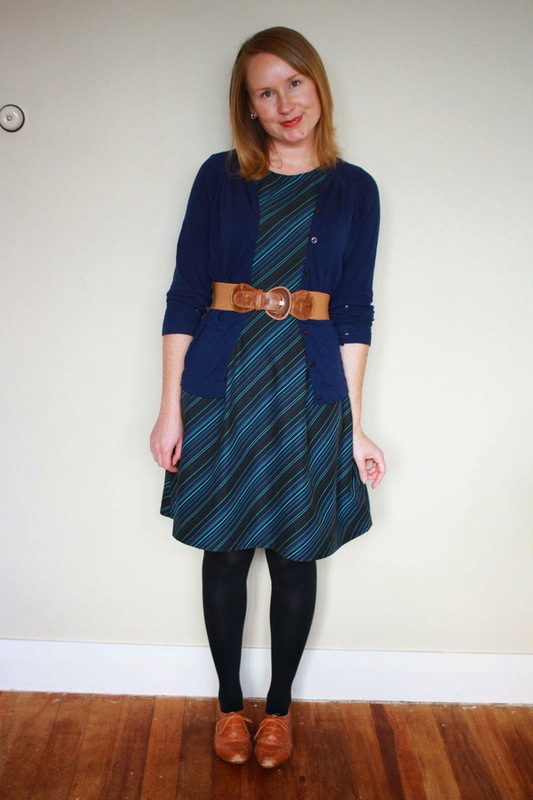 Wearing - as yet unblogged Anna-Emery dress (Anemery?) and my birthday present from David, a pair of Swedish Hasbeens. So, did you learn anything interesting from your Me Made May experiment this year? 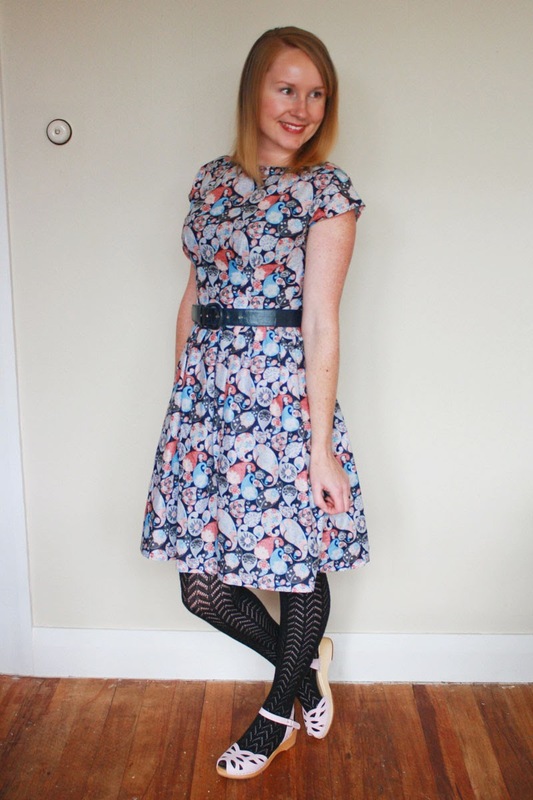 27 comments on "Me Made May 14 - Outfit Round Up & What Have You Learnt? (If anything...)"
So many people have talked about being happy that taking photos are over, but to be honest I'm sad! I mean I have been slack with taking photos, but I've really enjoyed peeking into other people's lives and closets! Wow, I am such a creeper. Hehe, I so know what you mean! So many new ideas for me mades are floating round my head now! When do we get a 26hour day? Gorgeous outfits as usual Jennifer! I'm looking forward to the new pattern. Your Apples in Winter Dress and the gray cardigan are amazing. Oh the Hasbeens are fab! I'm getting myself some swedish clogs for my birthday too! In October :(. And I've got that apple seersucker in my stash, it's one of my faves and will one day be a shirt dress. 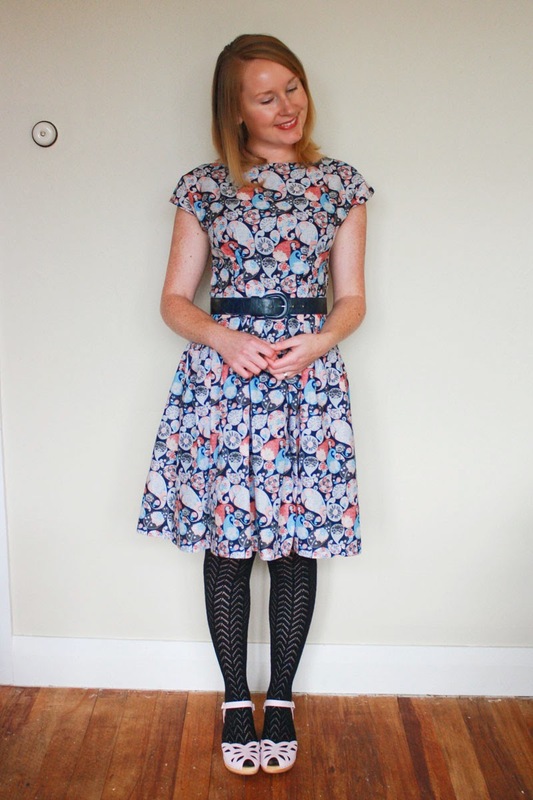 Your outfits have been lovely, looking forward to seeing your next pattern! You'll love that fabric! 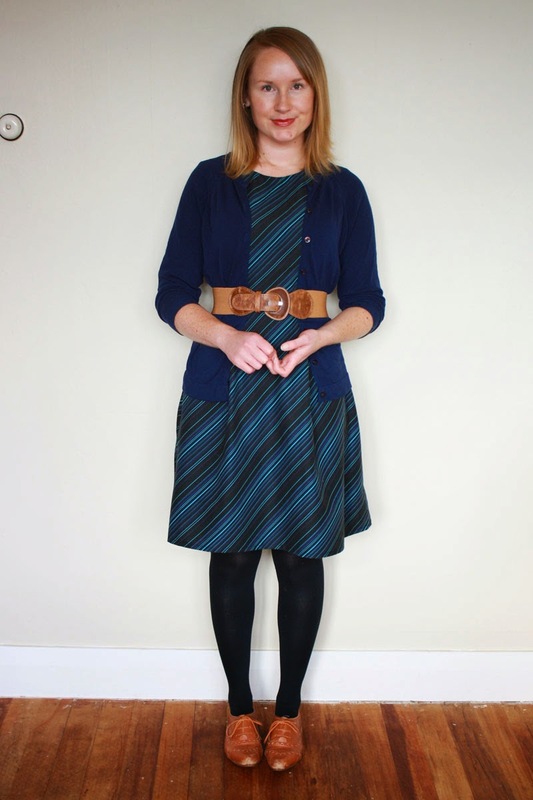 It's so light and comfortable but has enough body to make a nice sturdy garment - can't wait to see your dress! very nice Anemery and hasbeens. looking forward to seeing the Bronte! 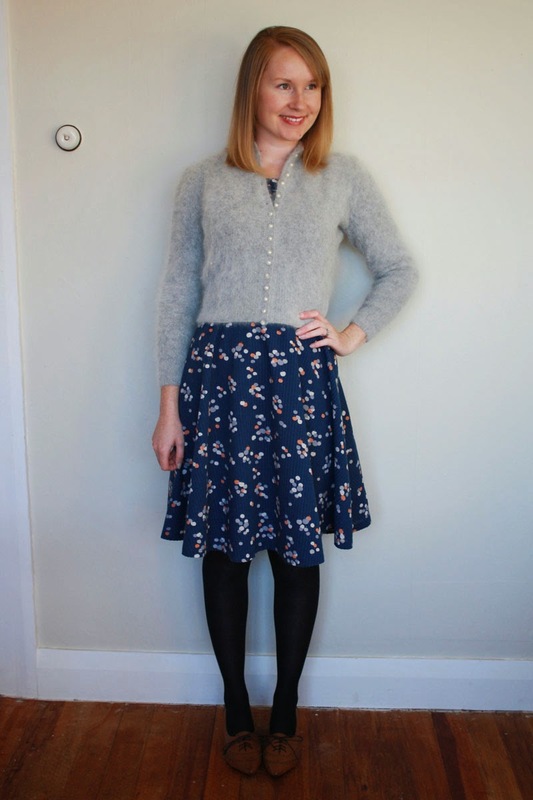 I love your style and your thinking around building your handmade wardrobe! You know, I think learning anything takes patience. You'll get there, promise. 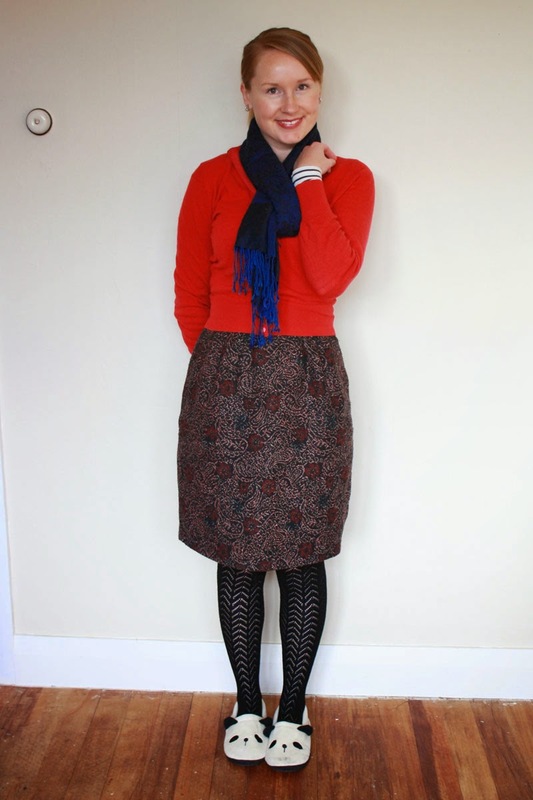 Maybe you could make more of the garments that you find you are wearing but up the difficulty level? 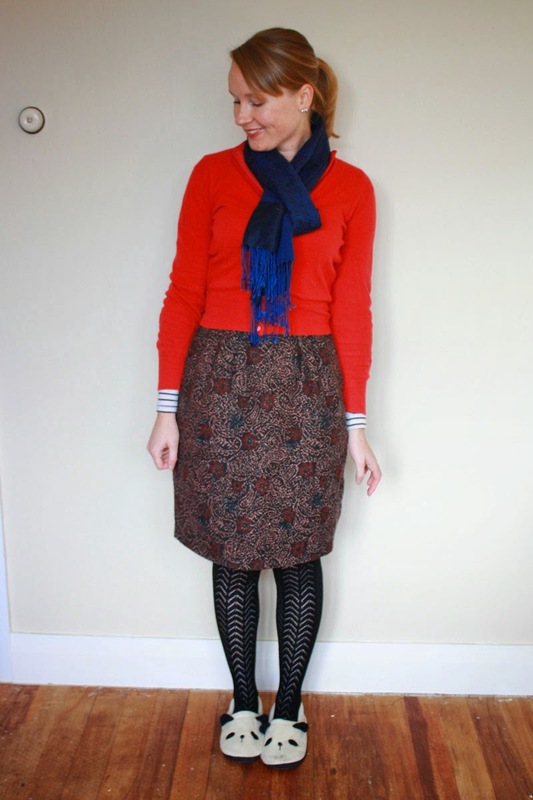 Try french seams or a different fabric? Before you know it, you'll have a bunch of lovely and wearable me-mades and you may have up-skilled enough to tackle some more difficult projects. Oh now I'm really looking forward to Friday :) Can't wait to see your new pattern! Your look really works for you! Looking forward to seeing that new pattern! I love your pointy brougues! Where did you get them? Thanks Tiffany, they were a birthday present to myself :) I got them from ASOS - the first time I've ever ordered from there and they arrived in super speedy time! 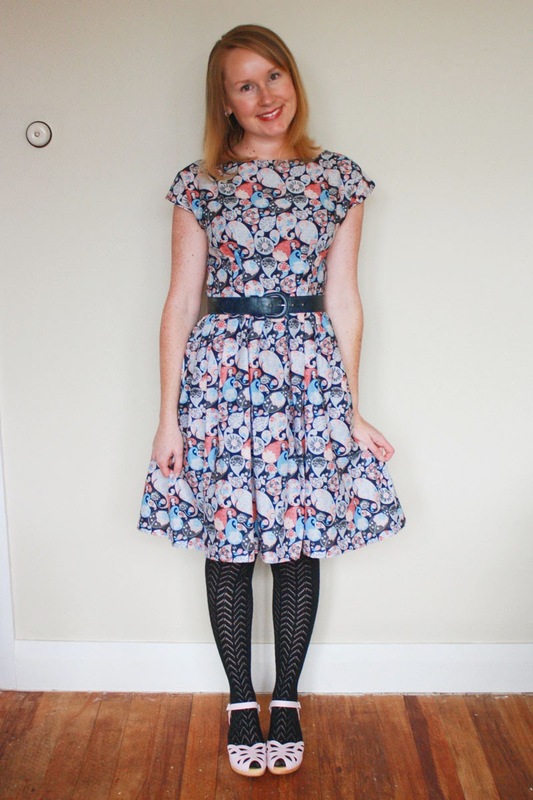 Love your Birthday dress- what a great print! I'm a little tired of taking daily selfies, but I have to agree with the first comment- I love creeping everyone else's wardrobes! I found that I need more bottoms, most of what I make are tops, and bags and jewelry, so this summer I want shorts and skirts and maybe a few dresses! I'm so sneaky! 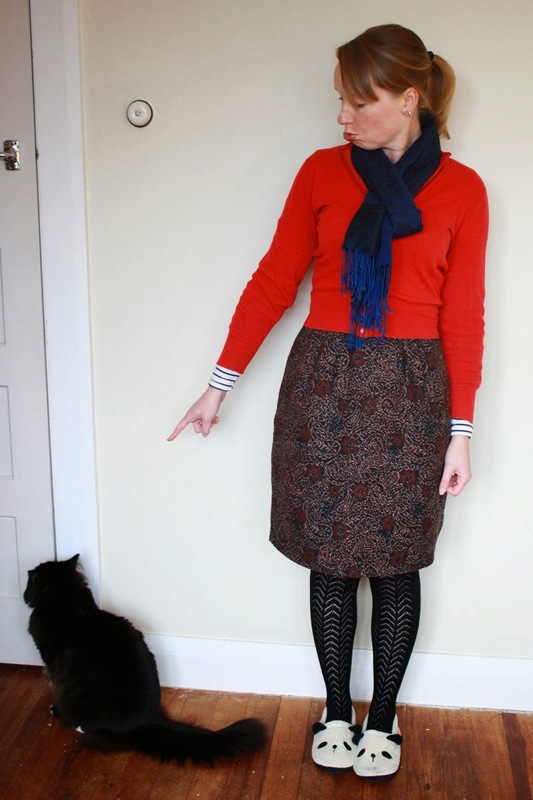 Yes, it's another top, but a skirt pattern is on the way, due hopefully at the end of July. Need some bottoms to even out all these tops I'm making :) But it's in the vein of a circle skirt - I couldn't resist! You have the greatest style! I've really enjoyed your outfits this year. 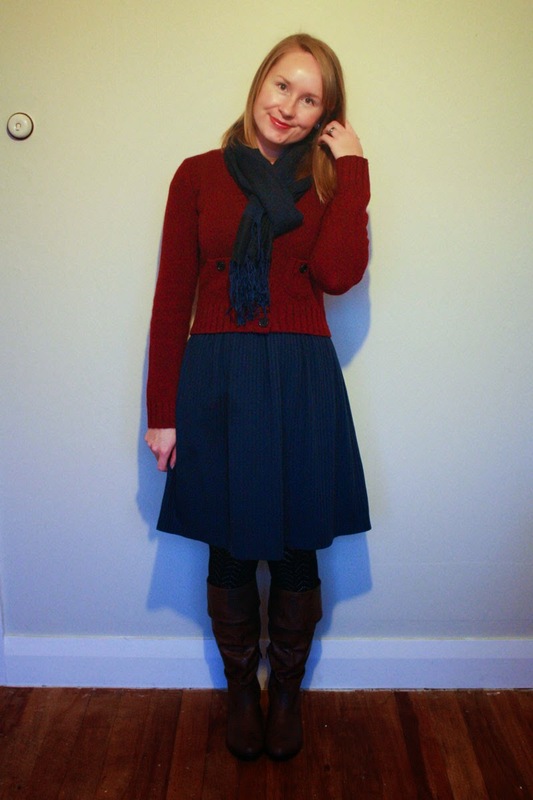 I'm a major repeater of outfits, too, and I don't think there's anything wrong with that. It's just easier that way! I did MMM, but didn't document it (so did it really happen?) and I realized a lot of things about my wardrobe during the month. 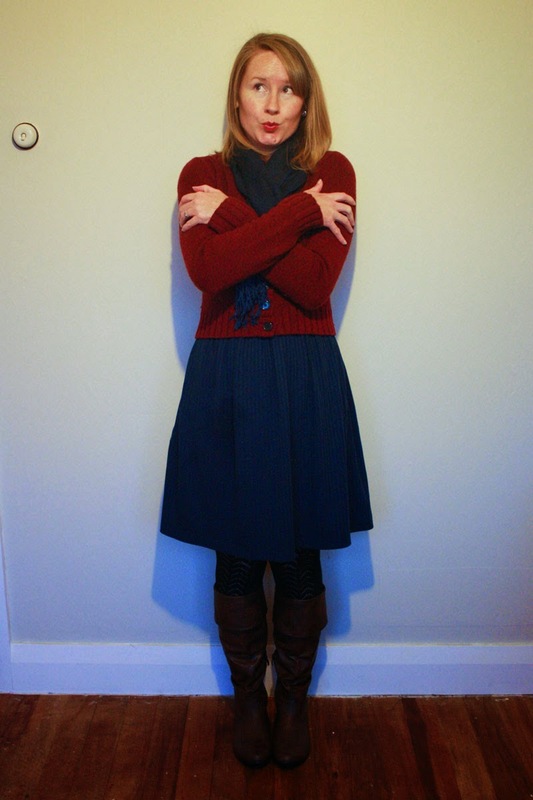 Mostly it is that a pretty large chunk of my wardrobe is me-made, and I'm pretty happy with most of it. I'm really starting to refine what I like to wear every day, and to make pieces that get heavy wear. I also realized there are several me-made blouses that are short sleeved, but I really prefer how they look with a cardigan (and wore them all winter, frankly), so I'm going to recategorize them as late fall-winter-early spring pieces rather than late spring/summer/early fall pieces. By the way, your green top + black circle skirt is perfection. Once I'm done nursing and the need for button down shirts all the live-long day, this is basically my uniform. Right now it is an a-line skirt+button down scoop neck blouse with kimono sleeves, which is fine, and I have plenty of options, but I'm ready for some non-nursing items to come out of storage! Thanks Juliana!! I don't have a child but I can definitely see the need for a simple everyday outfit that doesn't require too much thought but that makes you feel comfortable. I hope you're able get some 'non-maternity' clothes out soon!! I love your birthday dress!! Happy belated! You did look great Jen. Happy belated Birthday, hope you had a lovely day. MMM does make you look at your clothes a bit differently and I have realised I need more tops and some cardigans (which I said last year as well). I am really looking forward to seeing your new pattern! I realised during MMM that I need more bottom half stuff, I would love to make myself a pair of trousers during the next year. I also need more winter stuff but I kind of loose the will to sew during the winter and knit or crochet instead! Must find motivation this year!